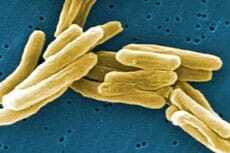 Under the cover of a mesenchymal stem cell, the tuberculosis (TB) bacterium persists, even years after living asymptomatically. A new study in Science Translational Medicine provides evidence for this “wolf-in-stem-cell-clothing” model. Researchers led by Dean Felsher and Antonio Campos-Neto worked off the hunch of Bikul Das, first author on the study. Das spent years as a clinician in India, where he observed TB bacteria in bone marrow samples of patients. The researchers initially studied a mouse model of disease, finding that the TB bacterium hid in a stem cell niche, and expanded the investigation to patients in India, who showed signs of the bacteria in stem cells obtained from the bone marrow.